This well-thought-out design gives you all the best advantages of a ninja karambit in the compact style of a neck knife. This unique neck knife features a 3.5 in. stainless steel blade with a heat-treated black finish for a covert look and feel. The contoured handle has a rubberized texture and gripping notches to ensure a ninja-strong grip. 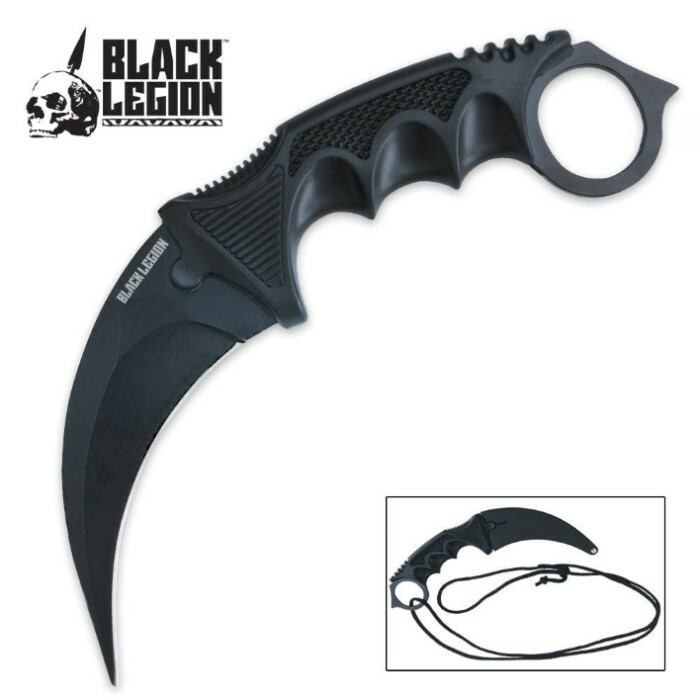 The traditional karambit thumb hole allows you to maneuver it as you would a regular, full-size karambit knife. We’ve included a neck sheath and lanyard so you can wear it right around your neck, ensuring that it’s always close by and within reach at a moment’s notice. Don’t go unprotected! 7.5 in. overall. Don't let the price fool you. This is a very nice knife and is the perfect size for a lady's purse or a jean pocket. Knife is nice and you can easily sharpen the other side, but the necklace part isn't very good. It fell apart within a week for me, and I didn't wear it for much. It cant stay on during any quick movement. 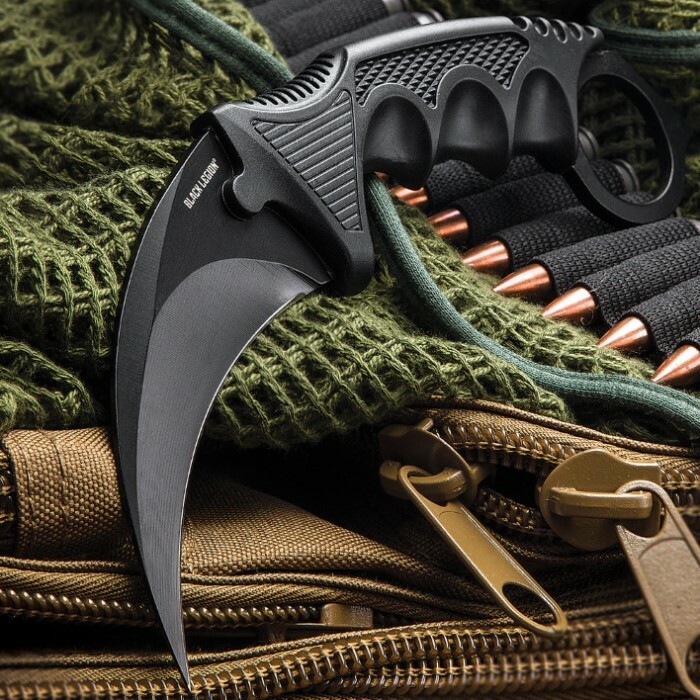 This karambit is almost identical to the Honshu only smaller in size. The sheath is a hard plastic that fits over the blade but doesn't have a belt loop or clip. Great knife if you like the Honshu but don't want to spend the money (although I highly recommend the Honshu). Single side blade, hard molded plastic grip and sheath. Black legion has been a manufacturer I have been satisfied overall with. The edge wasn't sharp enough for my preferences but the point had more than exceeded my expectations; and in spite of a low quality edge the knife very easily cut a thick cardboard box without much resistance without extra sharpening. The retention of the plastic sheath feels secure enough to carry as a neck knife and also feels very comfortable carrying inside the waistband. I think the steel is okay for it's job- you're not going to get everything for so cheap. Just got this awesome knife from you guys for Christmas along with a Bowie knife. This karambit is sick and I love spinning it. It's sharp and has a nice feel to it. I can also use it as a good oversized neck knife. Thank you Budk! It's just the right size and weight and it fits my hand perfectly. I like the holster, too. It snaps on. This knife comes with a very sharp tip and feels very sturdy. This thing is AWESOME!! Absolutely made for fighting and or self defense. I know a lady at work with the Honshu rainbow bladed version of this. But I like mine better. Probably because I didn't pay as much. Either way, this is a great knife. Get it! Thanks BudK!